Including return international flights, all accommodation, bullet train travel, breakfast daily, in-depth sightseeing of some of Japan’s top destinations, and more. per person twin share |	Typically $4,029! 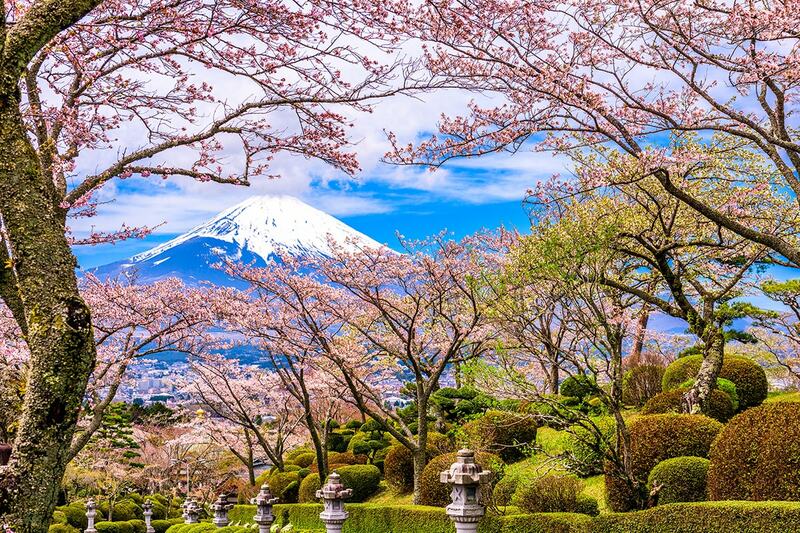 Experience the ultimate introduction to the delights of Japan, following the path from Osaka to Tokyo on an 8 day Japan Golden Route tour. Osaka has a reputation for its blend of modern and old-world architecture, its thriving nightlife scene and its economic clout. 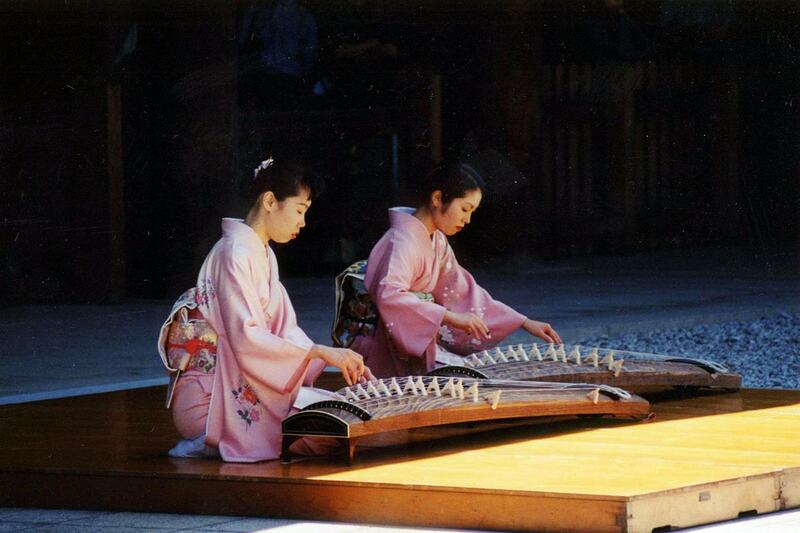 In short, it makes the perfect place to start your tour of Japan. Take up the option to add on the Hiroshima and Himeji tour extension, or dive straight into your discovery of Osaka by taking in sights such as Todaiji temple and Nara Park. 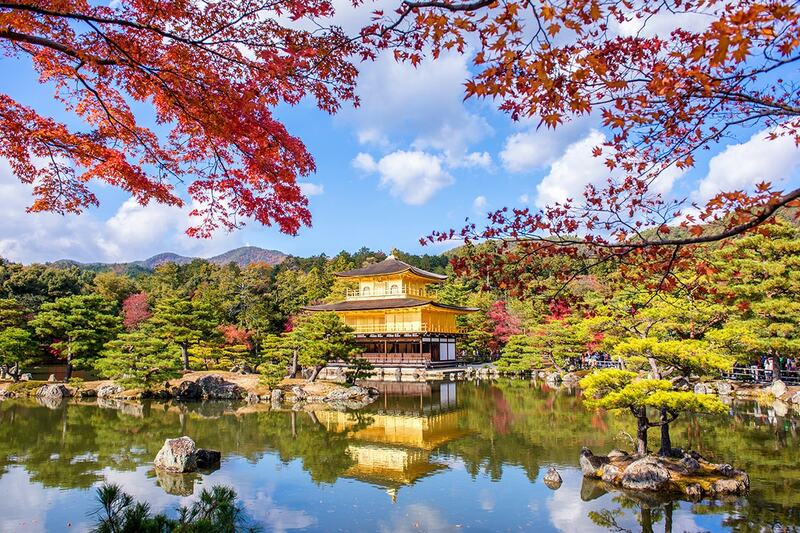 Kyoto then beckons, where you can tick off the UNESCO World Heritage Site-listed Kinkaku-ji and Nijo Castle. Marvel at the innovation of the Shinkansen bullet train as it whisks you from Kyoto to Shizuoka. 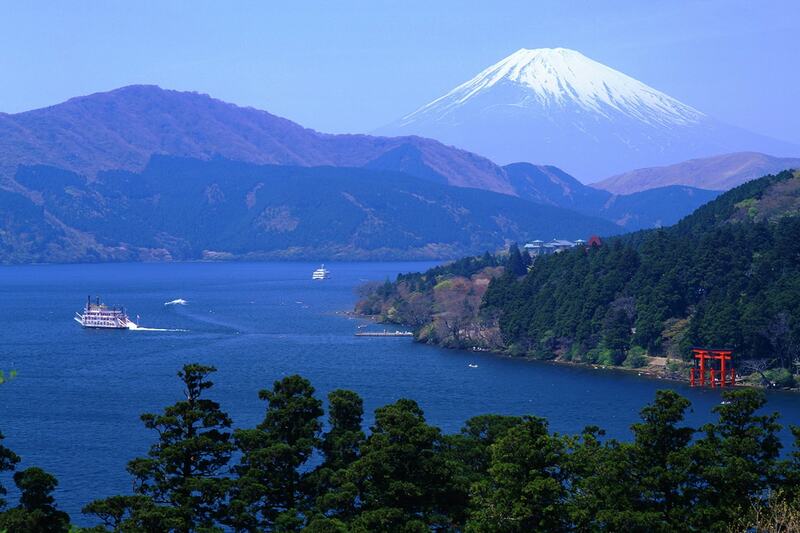 Head out into the Japanese countryside towards Mount Fuji and Ashinoko Lake. Capture the beauty of the landscape and be treated to a panoramic bird’s eye view of Fuji Five Lakes from Mount Fuji Fifth Station. 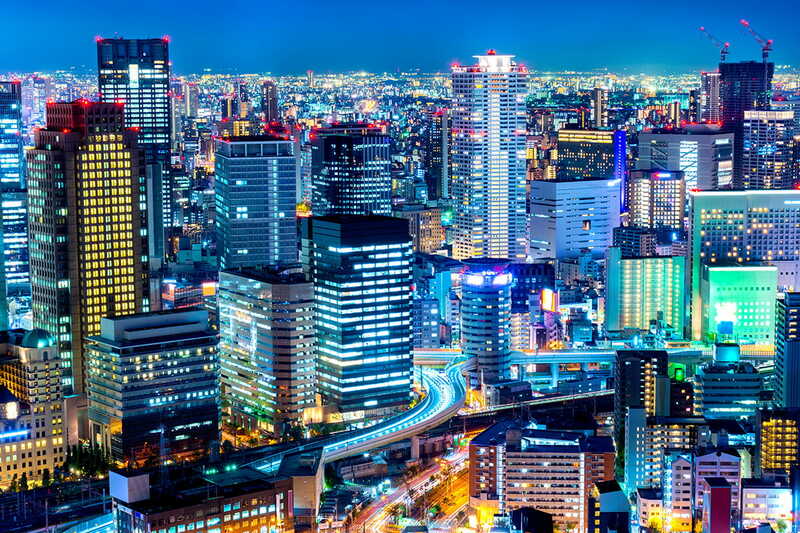 End the tour in Tokyo as you immerse yourself in this never-sleeping metropolis. Pack your bags and head to the airport to catch an overnight flight from Australia to Osaka. (Please note that some flights may depart 1 day later). Arrive at Osaka’s Kansai International Airport (KIX) and meet a tour representative for the transfer to the hotel. 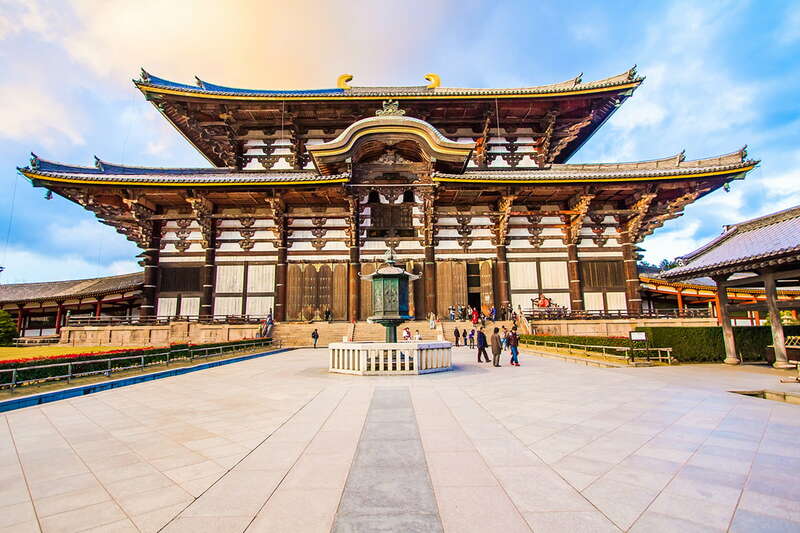 The first stop on your Golden Route tour of Japan is Todaiji temple in Nara. The temple houses a huge, 15-metre tall bronze statue of Buddha and the gate leading to the temple is flanked by two Nio guardians. The group walks through Nara Park afterwards. 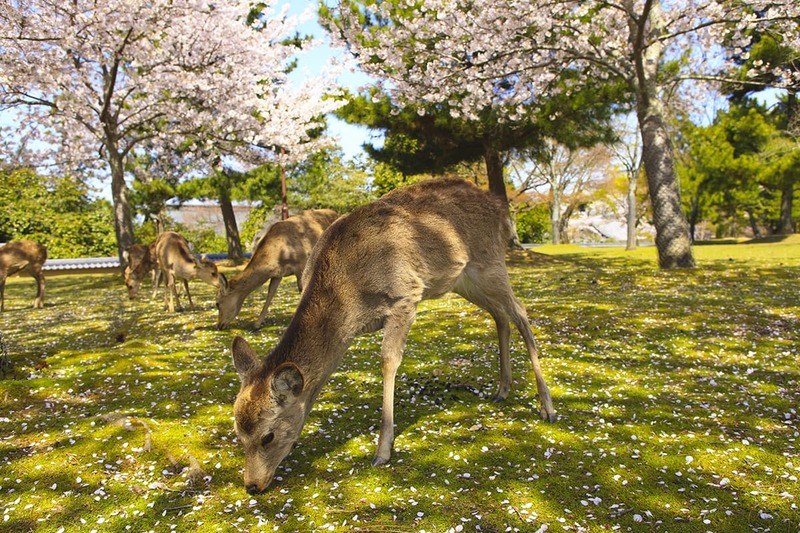 The park is one of the oldest in Japan and is most famous for its 1200-strong herd of free-roaming deer. Feeding the deer with ‘deer biscuits’ has become a popular draw for travellers. The tour then travels to Kyoto to see the UNESCO World Heritage Site-listed Kinkaku-ji, also known as the Golden Pavilion. 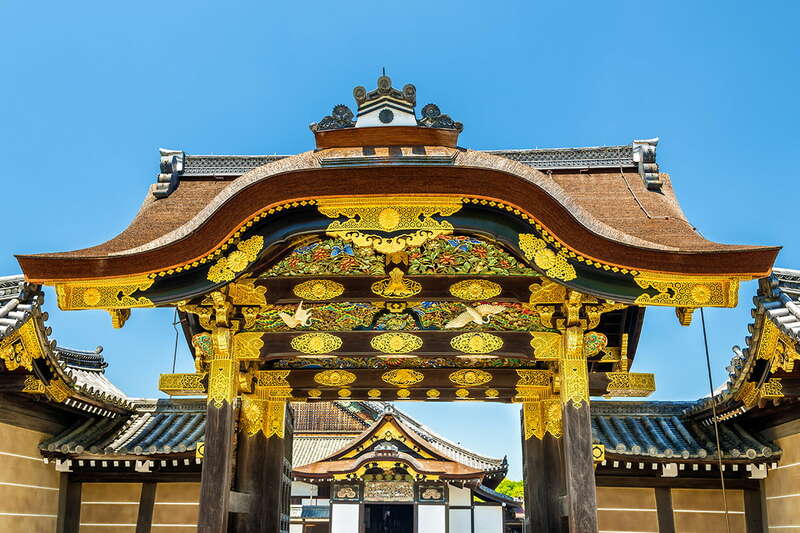 Visit the city’s Nijo Castle, which was once the Kyoto residence of the Tokugawa Shogunate. Then make for Togetsu-kyo Bridge. This wooden bridge links the banks of the Katsura River and is a great vantage point for admiring Arashiyama Mountains. In the afternoon, head to the rail station to board one of Japan’s most famous technological innovations: the Shinkansen bullet train. The train reaches speeds of up to a heart-racing 280 km/h and has you arriving in about two hours. The group makes its way towards the serene Mount Fuji area near Ashinoko Lake. This lake was formed following a volcanic eruption 3000 years ago and now, along with the mountain in the background, makes one of Japan’s most spectacular and recognisable scenes. There is a visit to Oishi Park and Mount Fuji 5th Station. The latter offers an incredible sweeping outlook over the Fuji Five Lakes area below. Travel to Tokyo in the afternoon. 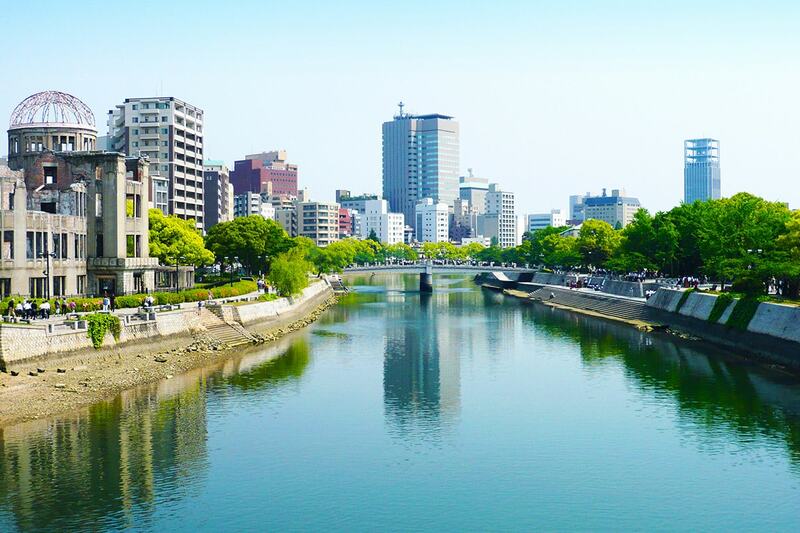 Japan’s capital is as diverse as it is exciting and thrilling. It is a city where old traditions collide with modern technology. 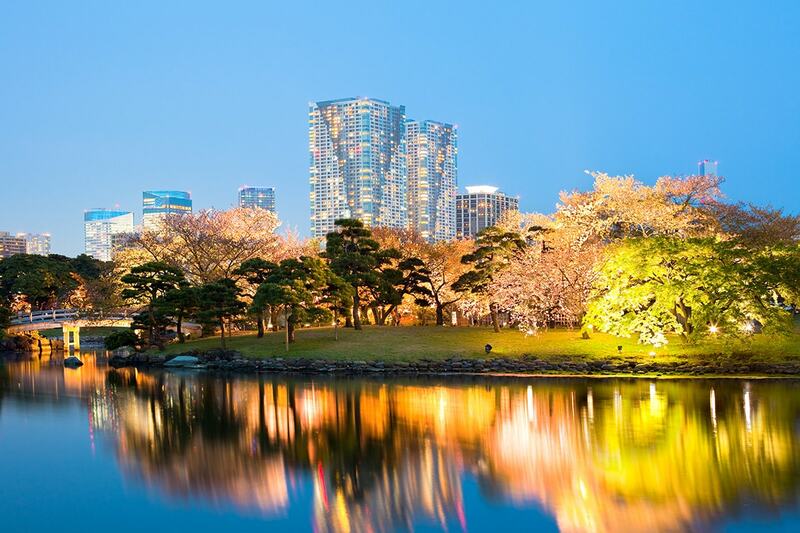 Your discovery of Tokyo begins at Hama-rikyu, a meticulously landscaped garden located in the heart of the city. Wander along the banks of the seawater ponds or visit the island-perched teahouse. 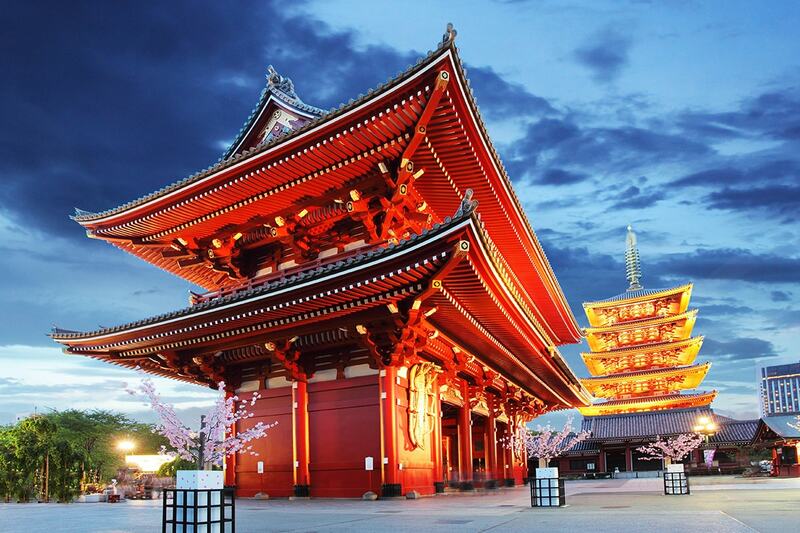 Embark on a scenic cruise along the Sumida River and then mosey through the Asakusa Kannon temple (also known as Sensoji), one of the most colourful in Tokyo. Swap shrines for shopping by looking for souvenirs and keepsakes at Nakamise Shopping Street. The last stop of the day is the Tokyo Metropolitan Government Building Observation Decks in Shinjuju to take in panoramic city views. A transfer will take you to the airport at the appropriate time for your return flight to Australia. Board an overnight flight to Osaka. (Please note that some flights might depart 1 day later). You land at Osaka’s Kansai International Airport (KIX) and will be met by a tour representative, who escorts you to the hotel for check in. Enjoy breakfast at the hotel before travelling to Hiroshima. Stop off at Himeji to see its castle along the way. 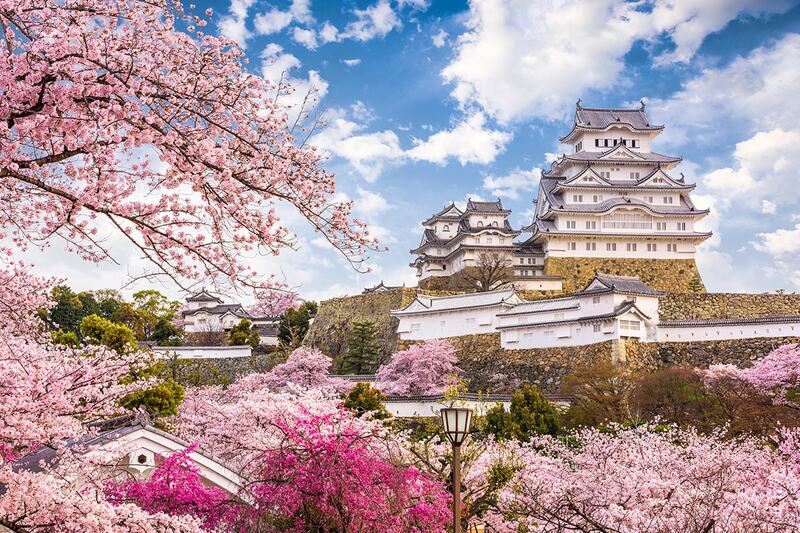 The hilltop Himeji Castle comprises 83 buildings and showcases advanced defensive systems from the feudal period. Move on to Hiroshima to spend the night here. As the location of the first atomic bomb drop during World War II, the trip to Hiroshima offers insight into the impact of this devastation. 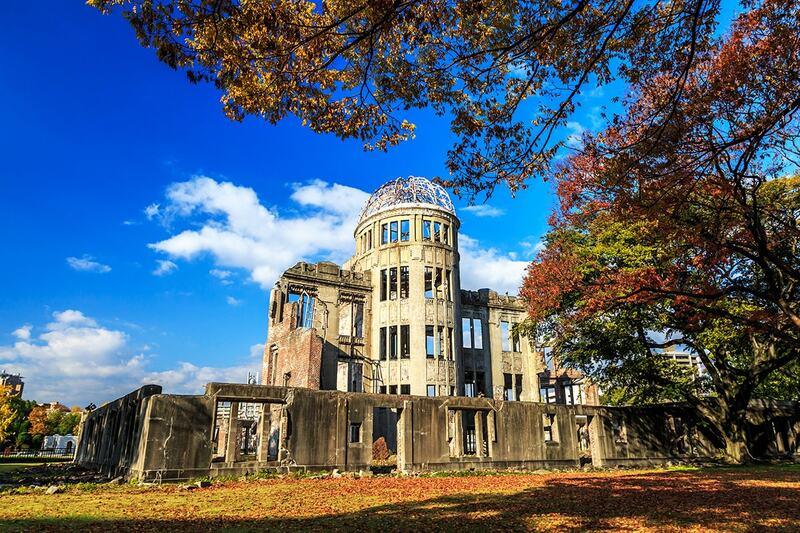 Visit Hiroshima Peace Memorial Park, which commemorates the victims of the bomb drop. 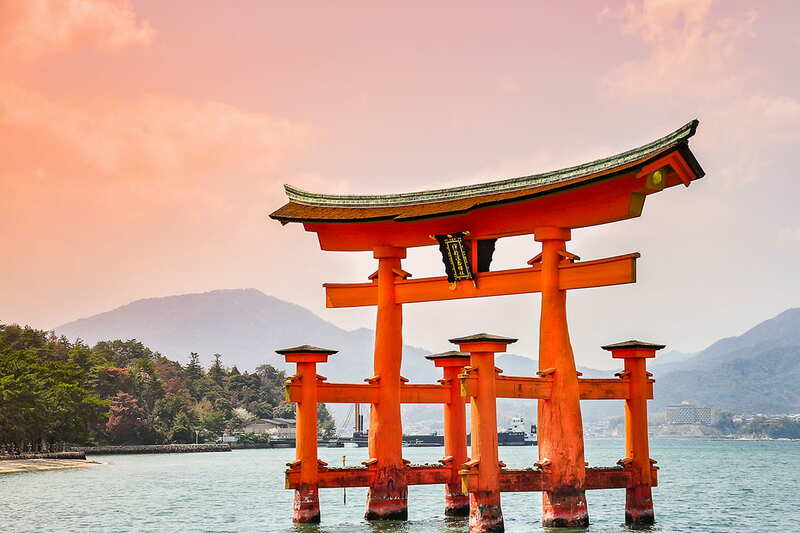 Then travel to see the Itsukushima Shrine in Miyajima and see the torii gate as the waters move with high tide. Head back to Osaka afterwards. 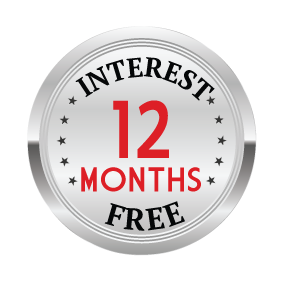 A deposit of $1,000/$1,060 per person are due at the time of purchase in order to secure your date. 8 Day – $950 per person in addition to the twin share voucher. 10 Day – $1,150 per person in addition to the twin share voucher. * Peak Season Dates – $350 surcharge per person applies on these dates, please refer to the calendar. Brisbane, Adelaide or Perth Customers – A $300 Interstate surcharges applies per person.